Added configuration UI in the Persona Bar. Now the provider is not automatically enabled during installation, you need to use the new UI. 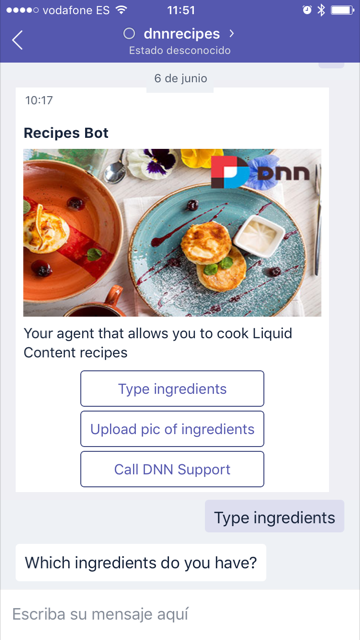 A few months back we spent some days working in an internal hackathon at DNN Corp. called DNN Developer Days that allowed to explore the power of Evoq Liquid Content APIs. The result was an awesome set of project examples giving a glimpse of what you can do when integrating the APIs to publish and reuse the content through different channels, such as Amazon Echo, Azure Bot Service or a smart TV, including AI and machine learning capabilities such as tagging your site images automatically. You can explore all of them at http://builtwithdnn.com website, I hope you find them interesting. Integrating Artificial Intelligence (AI) into your site or application is easier than you think. Companies like Google, Microsoft and Amazon are making big bets on AI and machine learning. All three companies provide freely available toolkits and services that developers can use to integrate AI into our applications. 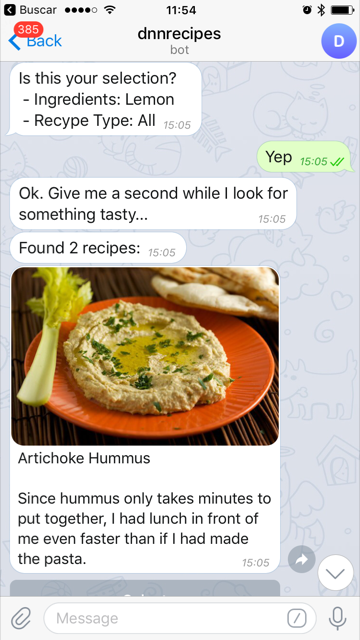 The recipes bot integrates with messaging apps like Skype, Telegram or Facebook Messenger. As a Skype user, for example, you can provide the bot with a list of ingredients. The bot connects to Liquid Content to retrieve recipes that contain those ingredients, then provides an answer to the Skype user. This is just the beginning. 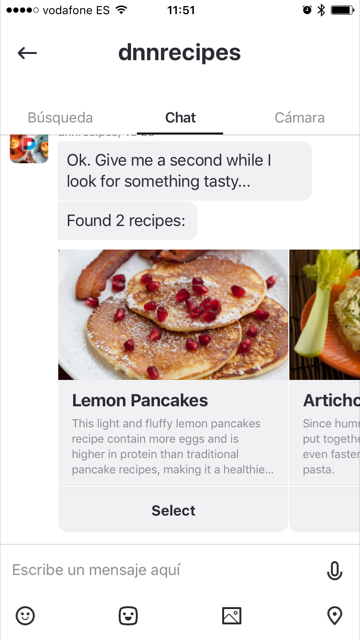 I plan to connect more third-party services to the recipe bot, such as LUIS, Cortana, Vision API and Apple Pay. Bookmark this page and check back here to get updates. I’ll update the page each time there’s news to share. You can also follow me on Twitter @davidjrh and I will mention the new additions there. In this tutorial, I show you how I built the recipe bot. The bot uses the Azure Bot Service, the intelligent, serverless bot service that scales on demand. With this service, you will be able to publish your bot through multiple channels without managing or patching any server. It can connect to additional messaging apps without writing or adding new code. The service is free, and you will only pay for the resources you consume. An active Azure subscription. You will need to login as owner of the subscription to host the bot service. You can sign up for a free subscription here. Download and install the Bot Framework Emulator. Install the Azure Functions Core Tools. Download and install the Command Task Runner Visual Studio Extension. Download the source code for your bot (from Azure), as described in Set up continuous integration section below. Complete previous steps first. For more information about how to setup the debugging environment, visit Debug with the emulator and Debug an Azure Bot Service C# bot on the bot framework documentation. Hi all. After a while working with React/Redux and the new DNN PersonaBar model introduced on DNN Platform 9.0, I have started to update all my modules to avoid the use of the disappeared Host menu on DNN. If you have any interesting idea to add on the settings area, please let me know. I have been checking all the configuration settings that can be done through the Application Insights configuration system and I will start adding them for the next release. Updates for the Redis Caching Provider and Azure AD provider are the next ones. Hi folks! 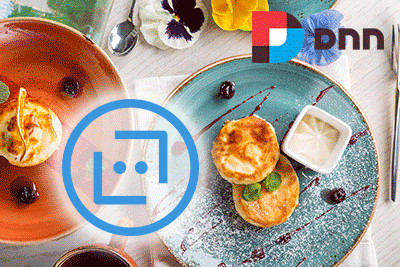 I am really excited to finally be able to talk about one of the areas in which we have been working here at DNN Software over the last months. If you haven’t heard, some years back we started to deliver Evoq products (previously known as DotNetNuke Professional) as a Service. This is a cloud based Software as a Service solution called Evoq OnDemand, which runs on Microsoft Azure. We have been continuously evolving our solution, adapting to new Azure Platform changes and improvements such as improvements on Azure App Service, SQL Database v12, Azure Active Directory or Redis cache to name a few. We advantage our customers by leveraging new tools as they appear. To share some numbers, we have already delivered more than 50,000 websites including Evoq trials and production environments, backed up around 400 terabytes of site information. While the log data size isn’t huge, managing 160GB of site logs per month is not easy from the operational point of view, especially when we need to troubleshoot performance issues on one of our customer properties and try to find the root cause. When an incident happens, our DevOps team need to figure out in minutes what is the cause, and in a cloud connected world the problem sources grow at the same rhythm that new service offerings appear: is an underlying infrastructure issue? Is a recent DNN update the cause? Is a 3rd party module? Is a 3rd party connected service? We needed to add telemetry and instrumentation to every single part of our cloud infrastructure, and not only customer properties but also our backend automatic provisioning systems. We have been covering our needs with NewRelic, successfully allowing us to dig into the problems and solving operational issues and, meanwhile, keeping an eye on Microsoft Application Insights’ evolution. Our monitoring needs kept growing, looking for aggregate views (i.e. how many websites are experiencing the issue we discovered on a customer log entry? How many websites are using this 3rd party module and experiencing performance issues?). So we continued trying other application insights tools like NewRelic Insights and Splunk for more advanced scenarios. And during Q4 last year we saw a demo of what Microsoft was doing in this field to improve the current Application Insights service. On the first demo we saw 70 terabytes of data filtered in almost real time, an advanced web tool for complex lightning fast queries, a desktop tool for multiple account aggregate queries, and the ability to consume the queries from a PowerBI dashboard. It sounded like the foundation of what we were looking for. As I mentioned before, our cloud infrastructure is not only serving customer websites or trials. 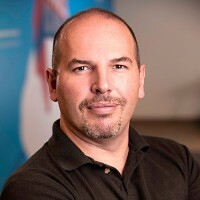 Some years back I presented at Cloudburst our set of cloud services for tasks such as automated backup and restores, Evoq product updates, order processing and account management. These initial services continued growing over the years and we have now new services for pageviews calculation (Evoq OnDemand is available in page view tiers), IFilter index offloading for Azure App service environment and others for background tasks. We also have continuous integration implemented for the nightly builds of Evoq and DNN Platform being deployed on Azure App Service. Having the ability to automatically send the Application Insights information to the Analytics store was the next requirement. We can then visit the Azure Portal and check what is going on with each website or service and find performance issues and what is causing them: if the problem is on server side, a dependency, or is just a new skin that the customer has applied to the website that is performing badly as we can see in the graph below where the server response was consistent but the Page Load time skewed upwards, indicating client-side problems. For every single web application, we are able to search not only by page views, requests, traces or exceptions. Since we have implemented a custom logger for DNN, we are able to search by DNN Eventlog records or the typical log4net data being stored under /portals/_default/logs. We finally have one place where we can query for all the parameters. 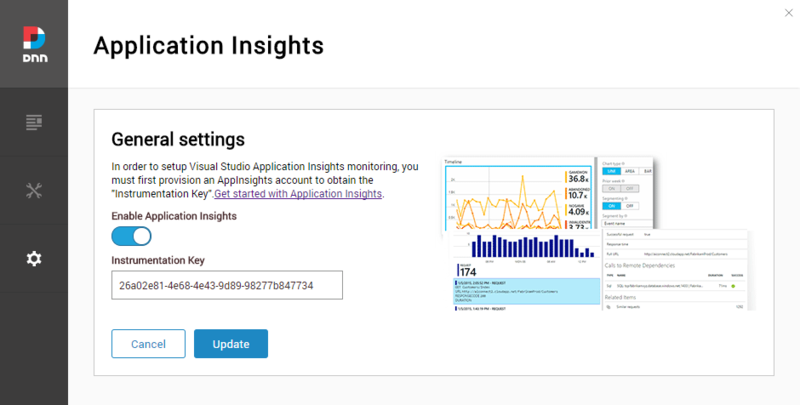 And once we have all the telemetry data sent to Application Insights, is now when we can start running advanced queries by using the new Analytics feature. Application Insights Analytics is a powerful query engine for your Application Insights telemetry that uses a query language named AQL. The language instead of nesting statements like in SQL, allows to pipe the data from one elementary operation to the next. We can filter all the raw telemetry data sent from each website by any field including DNN Eventlog records, execute statistical aggregations and immediately show the raw text results or with powerful visualizations. As part of our automatic Application Insights provisioning, we create alerts for each resource being monitored. When we receive an alert we start using the tool to start digging into the problems to find patterns by using AQL. The UI allow us to save predefined queries and load them for later use. One thing that is amazing and is getting better day by day, is the Application Insights Proactive Detection. This feature notifies you about potential performance problems in your app, by using “Near Real Time Proactive Diagnostics”. What you get are alerts on abnormal rise in the failed request rate, and no configuration is required! It just works. As example, check this alert we received today. I was shocked on the information provided by the service and how fast we go to the root of a problem. On this case was a bot requesting bad formatted URLs and causing an abnormal rise in failed request rate. We detected the problem thanks to the stack trace provided on the alert that arrived 15 minutes after the proactive analysis, found the problem, created a patch and problem gone. Do you love it? Me too! If you also have a DNN based website and want to get started with Application Insights and Analytics I have published on GitHub an open source module that allows to start sending all your website telemetry to Application Insights: pageviews, web requests, trace information (log4net log file contents), exceptions (including client side browser exceptions) and DNN Eventlog records. 3. Now from the Releases folder https://github.com/davidjrh/dnn.appinsights/tree/master/Releases download the latest module package version ending on “…Install.zip” (the Source.zip package contains the source code that is not needed for production websites). 5. Once installed, a new menu under “Host (Advanced menu)>Application Insights” will allow you to paste the instrumentation key obtained on step 2. After applying the changes, you will start receiving data on Application Insights after a few minutes.